Claire Hoevel, who was Senior Paper Conservator for the Folger Shakespeare Library when this article was submitted, is now Assistant Paper Conservator for the Indianapolis Museum of Art, 1200 West 38th Street, Indianapolis, Indiana, 46208. Ms. Hoevel wishes to acknowledge the guidance of Dr. F. Christopher Tahk at the outset of this study, and the encouragement and editorial advice of Marian Dirda and Karen Garlick who helped bring it to publication. Orange and reddish discolorations are often found in conjunction with the common sulfur-induced blackish product, lead sulfide, in white lead paint films. In 1983 this phenomenon was investigated at the Cooperstown Graduate Program under the direction of Dr. F. Christopher Tahk. Color pl. 1. White lead paint film displaying orange discoloration and black lead sulfide. The strange colors, then, do not present an unsolvable problem for the conservator, but the cause and chemical composition of the orange are intriguing mysteries. The following questions present themselves: What are the reactions that produce the orange and pink colors? Is the mechanism different from or related to the process that produces the black sulfide? Could these colors represent a transition product between basic lead carbonate and lead sulfide? Since the orange and pink colors do not accompany every blackened white lead film, what catalyzes the phenomenon? The first step in the research project was to analyze the pigment using x-ray powder diffraction. With this technique an unknown crystalline substance can be identified if the powder photographs obtained can be matched with the diffraction patterns of known materials. In this case, powder photographs were taken of undiscolored white lead (basic lead carbonate) and of discolored orange particles from a white lead area on an artwork. Surprisingly, the white lead particle and the orange particle yielded identical patterns. Although unexpected, these results helped to correct the popular misconception that the orange substance is actually red lead formed in situ from the white lead layer. Red lead, Pb304, which can be made by slowly heating white lead at temperatures around 480°C, gives a distinctly different powder photograph. Microscopic examination of the orange particles using a Zeiss polarizing microscope was disappointing because the particles did not display morphological characteristics that could aid identification. However, the fact that certain orange particles were spotted with black lent credence to the theory that the orange color represents an intermediary product between basic lead carbonate and black lead sulfide. 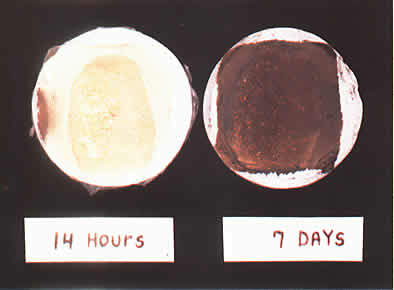 Examination of a cross section of a discolored white lead film provided further support for this theory. 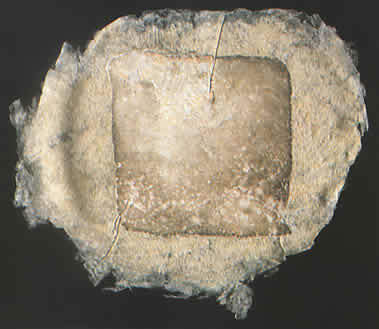 The cross section showed the following layered structure, from the paper outward: first, a white lead stratum; second, a thicker, uneven orange stratum; and third, a few intermittent spots of black sulfide. To study this phenomenon, circular pieces of 100% unbleached cotton paper were painted with an early twentieth century white ink composed of white lead pigment in a water-soluble binder. The paper circles were then secured into the lids of small jars. All jars contained a saturated solution of sodium sulfide with deionized water added to produce hydrogen sulfide gas. Buffers and salts were added to the jars to regulate humidity and pH at room temperature. The three salts used were potassium bromide (84% RH), sodium bromide (58% RH), and sodium chloride (31% RH). The two buffers were potassium acid phthalate (pH 4) and monobasic potassium phosphate and disodium phosphate (pH 6.86). When the lids were screwed into place, the paint samples were bombarded with atmospheric sulfur in all possible combinations of these climatic variables. After a week, the jars were opened and the paint samples examined. At first, the samples did not appear to show any orange or pink. All had converted to various shades of brownish-black sulfide, and none displayed the seemingly random appearance of the orange color that is often seen in artworks. A second look, however, confirmed an outbreak of pink in a control jar containing no added buffers or salts. Chance fingerprint smudges had contaminated this sample, and pink developed exclusively beneath these fingerprints. Color pl. 2. Two white lead samples marred with thumbprints. After fourteen hours, pink discoloration is visible beneath the thumbprint; after seven days, the thumbprint area has darkened with black lead sulfide. A second set of paint samples, deliberately marred by thumbprints, was placed in the atmosphere jars. Within fourteen hours the thumbprints turned bright pink, with the surrounding areas of white lead darkening to lead sulfide. After a few days the edges of the pink whorls began to turn black. Within a week's time the thumbprints had blackened completely. Color plate 2. It seemed that some component of the fingerprints had reacted with the white lead and sulfur to produce a pink coloration. To test this assumption, three new white lead samples were prepared. Since fingerprints are comprised of grease and acids, one sample was smeared with Squibb Mineral Oil, a long chain hydrocarbon, to represent grease; a second sample was painted with suberic acid, an acid found in perspiration; and a third was dabbed with oleic acid. All three samples were returned to plain hydrogen sulfide atmosphere jars containing no buffers or salts. Color pl. 3. White lead samples smeared with mineral oil, suberic acid, oleic acid. 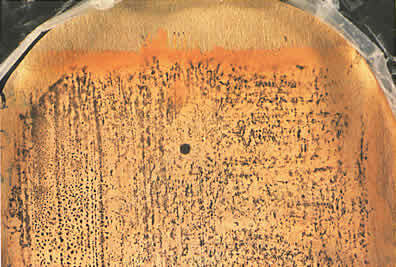 When exposed to a hydrogen sulfide environment, the acids induced pink and red-orange discolorations in the paint films. After three days, the samples were removed. The mineral oil smear had turned brownish-black with no trace of pink. The suberic acid tainted sample had turned salmon pink, identical to the pink beneath the fingerprints. The oleic acid had produced a red orange. Acidity, then, seemed to provoke formation of the pink color. Since acids are "proton donors" [acidity] and also polar substances, the question remained whether the orange/pink/red coloration was truly induced by protons or whether polarity was the key factor. To address this point, another sample was dabbed with polyethylene glycol (Carbowax), a non-acidic, polar substance. After subjecting this sample to the same conditions as the previous experiment, only black lead sulfide appeared—no orange or pink. At this point, the conclusion was drawn that white lead turns orange if in direct contact with acidity within a hydrogen sulfide environment. Research was then turned to the effects on white lead of acids actually found in paper. The first acid considered was carboxylic, an acid commonly found in aged paper. Circles of badly deteriorated mechanical wood pulp paper were painted with white lead and set into different atmosphere jars for three days. The result was a marked growth of bright orange color in the samples. All atmospheres, including those without buffers or salts, produced the same bright orange hue. Color pl. 4. Detail of a white lead sample on mechanical wood pulp paper. Bright orange was produced in a hydrogen sulfide environment controlled to pH 4 with 58% RH. However, the atmosphere that generated the most pervasive display of orange was pH 4 with 58% RH. Many common components in paper, such as alum, carbohydrate gums, bleach and pulping chemical residue, and various constituents of coating colors, are acidic or produce acid in subsequent chemical reactions. These components might be expected to influence white lead films. Color pl. 5. White lead sample on cast rag paper with a high alum content. After exposure to a hydrogen sulfide environment, pink appeared in the upper left corner of the paint square. Alum (aluminum sulfate—Al2(SO4)3 · 14H2O), a notorious source of acidity in paper, was chosen for further investigation. Alum has been used as a hardener for gelatin size and to precipitate resins, starches, and pigments onto fibers. In the eighteenth and nineteenth centuries, watercolor treatises recommended alum as an ingredient in homemade colors and as a preliminary wash before painting. 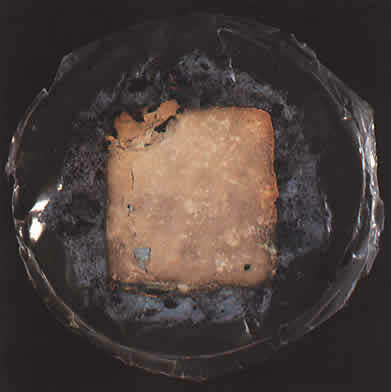 Both usages were intended to keep paint from sinking in to the fibers of poorly sized, soft papers.1 In the next experiment, circles of rag paper with a high alum content were painted with white lead and subjected to hydrogen sulfide environments. After a week, all samples exhibited some trace of pink. The same phenomenon occurred when the surface of the paint itself was brushed with an alum solution. Color pl. 6. White lead sample on a cast rag paper colored with Prussian Blue pigment. Orange discoloration appeared at the edges of the sample after five days exposure to hydrogen sulfide. Towards the conclusion of the project, questions arose about the role iron might play in the discoloration of lead white. Iron catalyzes the degradative reactions that produce acids in paper and might therefore be expected to promote pink discoloration in white lead films. Iron particles can be deposited in paper from a variety of sources throughout the papermaking process and sometimes announce their presence by causing foxing. Another source of iron is the pigment Prussian Blue (ferric ferrocyanide—Fe4(Fe[CN]6)3), a once common colorant in blue paper. In further experiments, non-acidic rag papers were coated with a 1% solution of ferrous sulfate and exposed to ammonium hydroxide fumes to precipitate iron oxides into the paper fibers. These rag papers were painted with white lead and set into atmosphere jars without salts or buffers. Eventually, these samples displayed a light orange coloration throughout the paint area. 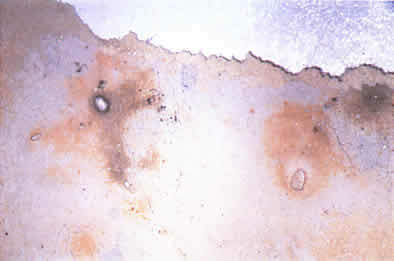 Basic lead carbonate exposed to sulfur in the presence of an acid-generating source in the paper or paint produces a pink/orange substance of unknown composition. With continued exposure to sulfur, this substance can convert to black lead sulfide. Acid may be only one factor in a complex mechanism that produces these colors, but introducing acid proved to be the only reliable way to induce the phenomenon under laboratory conditions. 1. Marjorie B. Cohn, Wash and Gouache: A Study of the Development of the Materials of Watercolor (Boston: Fogg Art Museum and the Foundation of the American Institute for Conservation, 1977), 21. Also consulted was B. L. Browning, Analysis of Paper , (New York: Marcel Dekker Inc., 1977).